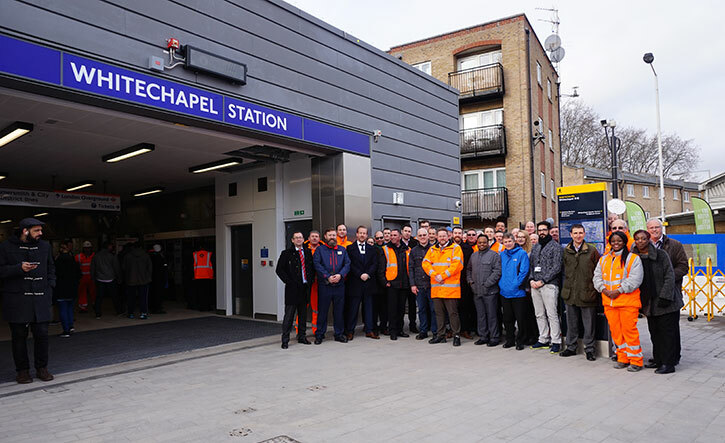 BBMV, the Balfour Beatty, Morgan Sindall, VINCI Construction joint venture, which is delivering the Crossrail Whitechapel Main Station Works contract (C512) has handed over Whitechapel’s temporary ticket hall station to London Underground. The temporary station opened to the public this week. The interim station re-routes passengers out of the station to ensure future engineering works take place in a safe environment with minimal disruption to the existing Underground and Overground services. It was officially handed over to London Underground for staff training in early December last year. This significant project milestone means that all the technical systems can now be migrated from the current main station building while it is upgraded, to make way for the new Crossrail concourse. BBMV began work on Whitechapel Station in December 2011 and is due to complete works in 2018. BBMV’s works are divided into three primary work sites which are located in the Whitechapel area, East London and include the refurbishment of the existing Whitechapel Station, the construction of a new station bridge concourse above the East London Line cutting and a new ticket hall. Works also involve the construction of new shafts and platforms for the Crossrail tunnels, related architecture and mechanical and electrical infrastructure. While works were underway to build the temporary station, the BBMV team reached an important project milestone in October 2015, logging one million hours without a RIDDOR injury - demonstrating their commitment to working safely and achieving Zero Harm in the workplace and on site. Reaching this safety target required great effort by the team who carried out complex civil engineering activities in a live operational rail environment.